Introduced in 1966 as a two-door coupe and revised in 1968 and 1971, the Dodge Charger quickly made a name for itself as one of the most important muscle cars ever built. The Charger nameplate started to fade as the oil crisis hit the United States in the early 1970s and disappeared completely in 1977. A fifth-generation model resurrected the brand in 1982, but the Charger was axed for the second time in 1987. The iconic name was revived yet again in 2006, when the Charger became the vehicle we all know today: a four-door sedan. The sixth-generation model was built until 2010, when a brand-new, evolutionary iteration was unveiled. For the 2015 model year, the Charger received yet another overhaul, this time receiving brand new front and rear fascias and a revamped interior. As we’re moving toward 2015, the refreshed Charger had the outrageous Hellcat engine and its 707-horsepower glory dropped under its hood. The amazing output figures that come with the supercharged HEMI V-8 place the Charger SRT Hellcat atop the four-door sedan segment in terms of horsepower and speed, while numerous exterior upgrades gives it proper, menacing looks. All told, the 2015 Charger SRT Hellcat plays in a league of its own. Read on to find out why. Updated 01/29/2015: Dodge unveiled a new video showing its latest Charger Hellcat hitting a top speed of no less than 206.9 mph. Enjoy! Click past the jump to read more about the 2015 Dodge Charger SRT Hellcat. As expected, the Charger SRT Hellcat follows in the footsteps of the Challenger SRT Hellcat as far as styling is concerned. 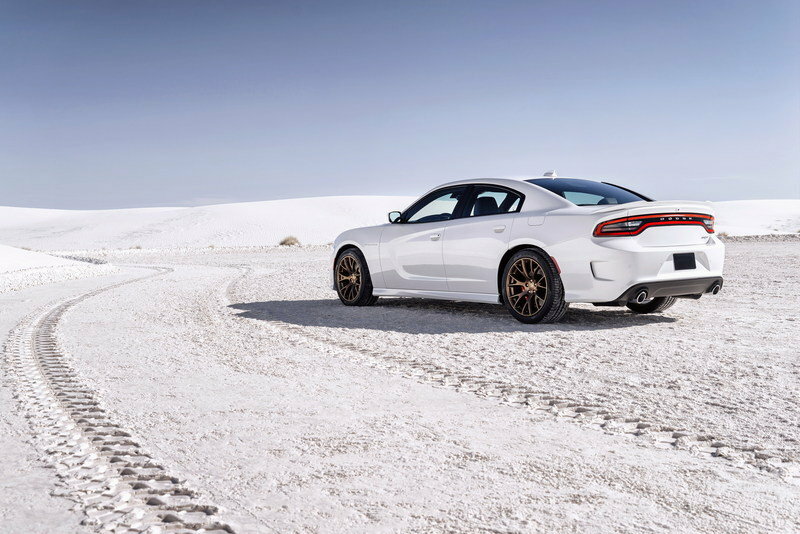 Unique front and rear fascias, a brand-new hood and a rear spoiler turn the already sleek-looking 2015 Charger into a sinister machine. Although the headlamps remain unchanged, the grille between them is all-new. 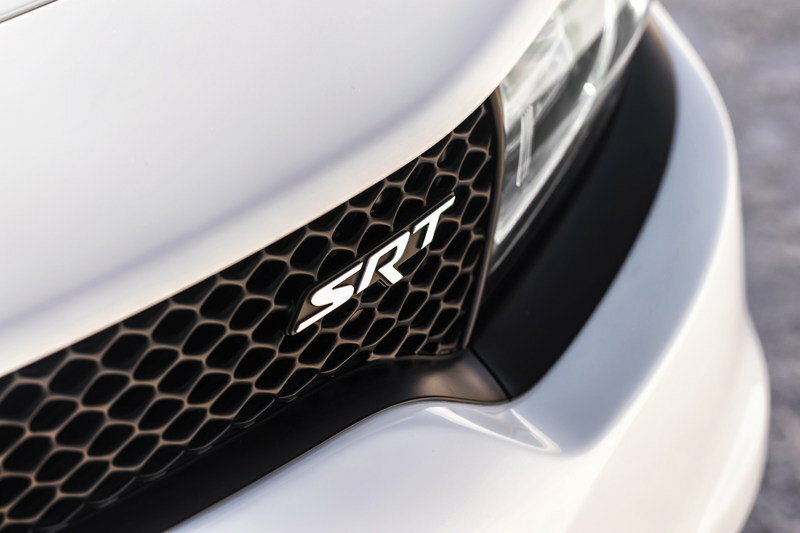 The piece ditches the familiar cross-hair seen on the average Dodge and adopts a honeycomb-like pattern and an SRT badge. The reshaped bumper carries a trapezoidal inlet featuring a similar grille and larger side intakes that no longer include LED daytime running lights. Down below, a integrated splitter optimizes airflow to the engine, while improving the sedan’s aerodynamics. Gone is the standard hood, now replaced by a power-bulge aluminum hood with cold-air intake and dual air extractors for optimized removal of heat and reduced air turbulence in the engine compartment. 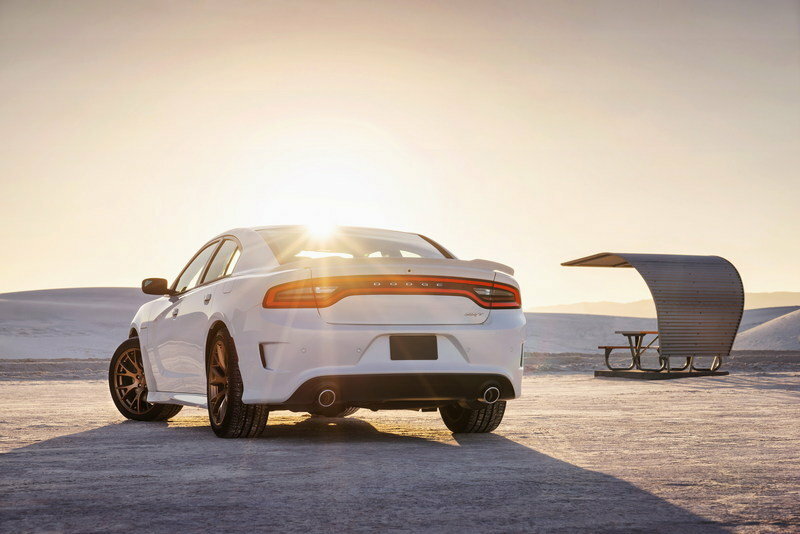 Around back, the Charger Hellcat stands out by with its trunk-lid spoiler, side bumper inlets, and four-inch, round exhaust tips. From the side, a "Supercharged" badge and a brand-new set of wheels will let onlookers know this is not a regular Charger. The lightweight, forged-aluminum, "Slingshot" wheels measure 19 inches and come in a split-seven spoke design. Wrapped in Pirelli P Zero tires, the rims can be had in either standard Matte Black or optional Brass Monkey (dark bronze) finishes. 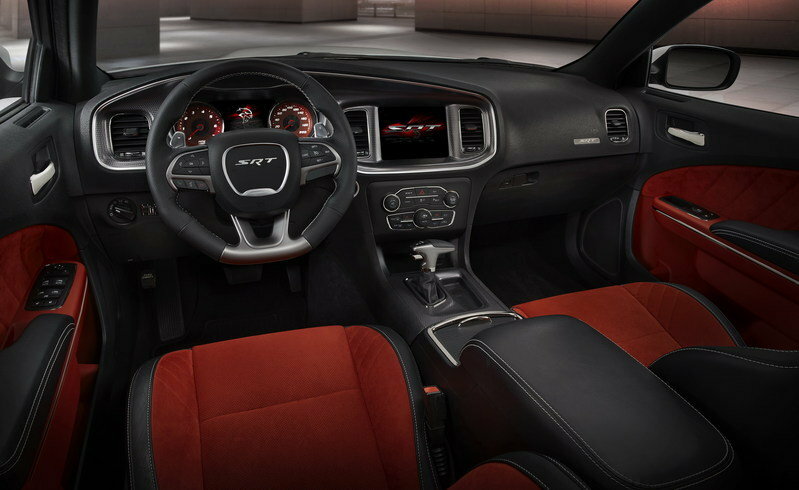 The Charger’s newly redesigned interior becomes sportier now that the folks over at SRT had the chance to meddle with it. 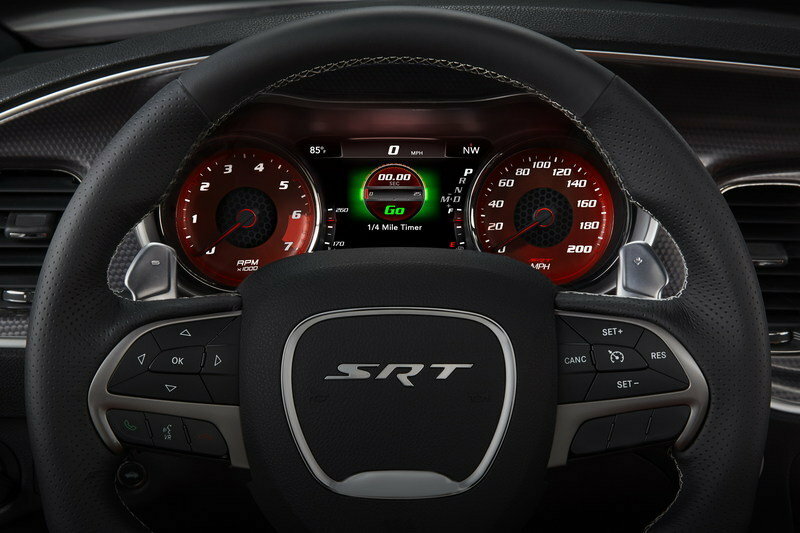 A flat bottom, SRT-branded steering wheel replaces the standard unit, The buttons to control the TFT display are larger and illuminated, while the the buttons for the Uconnect system have been moved along the bottom edge of the horizontal spokes. The new steering wheel also features a 360-degree heat element. The seats are also new, having been redesigned for improved cushioning and comfort. The high-performance front seats come with standard heating and ventilation, while the rear seats are only heated. 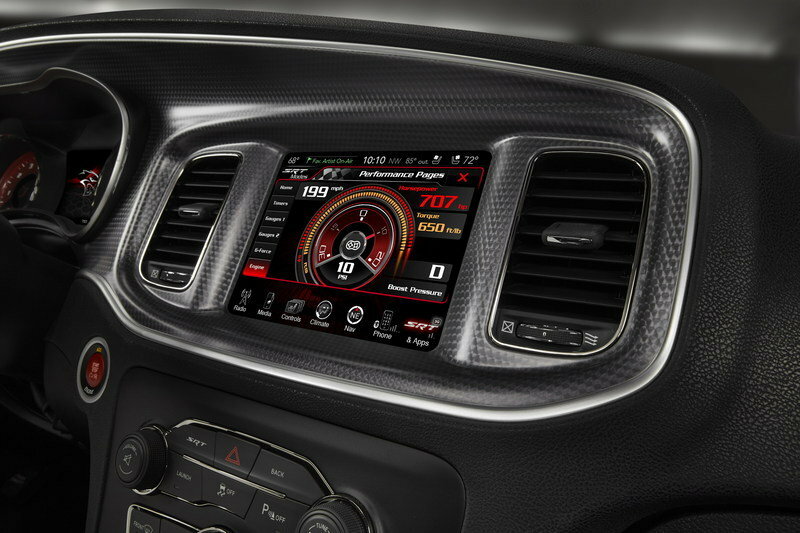 An all-new electronic shifter with a T-handle is also included in the SRT Hellcat package, as is the premium, 900-watt, 18-speaker Harmon Kardon audio system. Yes, it’s loud enough to cover the supercharged 6.2-liter revving under the hood, but we’d recommend against using it. Nothing beats a HEMI soundtrack. Making the Dodge Charger SRT Hellcat the fastest, most powerful, and quickest sedan on the market is the same supercharged, 6.2-liter, HEMI V-8 engine introduced in the 2015 Challenger SRT Hellcat. This devilish mill sends 707 horsepower and 650 pound-feet of torque to the rear wheels, enabling the Charger to return some staggering performance figures. 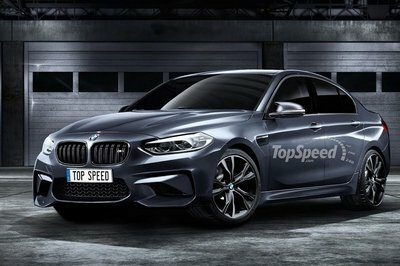 For instance, the sedan needs only 3.7 seconds to roar from 0 to 60 mph, making it a half-second faster than the current BMW M5. The extreme Mercedes-Benz E63 AMG S-Model is the only sedan that matches its 0-to-60 mph acceleration, but we’re talking about a vehicle that costs more than $100,000. 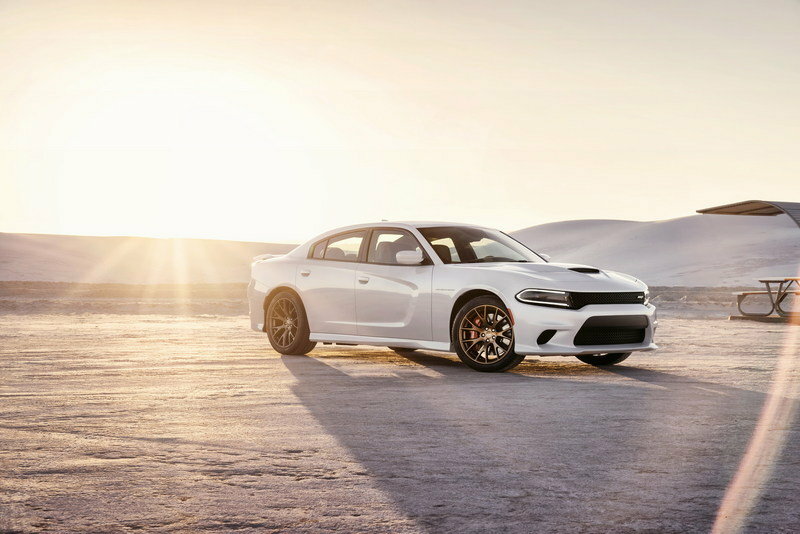 The Charger Hellcat is equally impressive on the drag strip, where it will blast through the quarter-mile in 11 seconds with ease — 0.2 seconds faster than the Challenger Hellcat. What’s more, that figure is NHRA-certified and is with street tires, meaning the Hellcat will be quicker on drag radials. Corvette Stingray who? Things become frightening in the top speed department, as the sedan maxes out at 204 mph. That’s more than most German high-performance vehicles and most sports cars can achieve. Heck, not even the Shelby GT500, the first factory-built muscle car to step into 200-mph territory, can’t match that benchmark. All these numbers are also courtesy of the standard TorqueFlite, eight-speed automatic transmission. Unlike the Challenger Hellcat, the Charger Hellcat doesn’t get a six-speed manual. Five driving modes are available. The "Eco" function maximizes fuel economy with revised shifting, pedal map and second-gear starts. The "Default" mode activates automatically when the vehicle is started, while the "Custom" mode allows the driver to personalize the car’s performance. 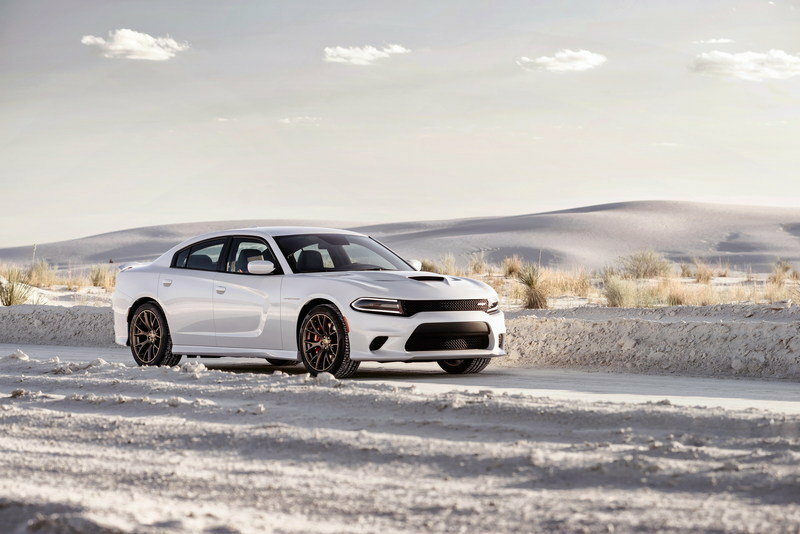 The "Sport" function delivers increased performance when compared to the "Default" mode, while the "Track" mode enables the Charger Hellcat to work at its full potential. The latter mode is suitable for smooth, dry surfaces. Just like the Challenger Hellcat, the Charger Hellcat benefits from two standard key fobs. 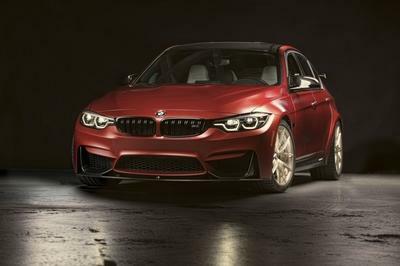 The red fob is attached to the only key that can unlock the 707 horsepower of the sedan, while the black key limits engine revs to 4,000 rpm, reduces output to 500 ponies and disables the first gear. Launch control and drive mode functions are also disabled, while ESC is turned to full-on. The new 2015 Charger SRT Hellcat is priced from $63,995, including $1,700 gas-guzzler tax. Since the Charger’s traditional U.S. rivals, the Ford Taurus and the Chevrolet Impala, will be no match for the Hellcat, we have to dig a little deeper into V-8 territory for the proper rigs. The closest four-door muscle car that comes to mind is the Australian-designed Chevrolet SS. Based on the brand-new Holden Commodore, the SS carries a massive 6.2-liter V-8 that delivers 415 horsepower and 415 pound-feet of torque through a six-speed automatic transmission. 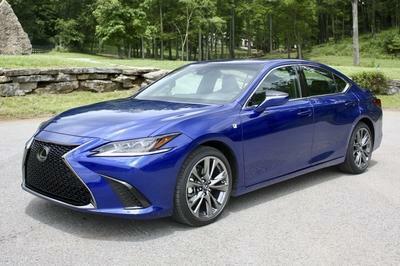 The rear-wheel-drive sedan charges from naught to 60 mph in 4.9 seconds. Sure, these figures are nowhere near those of a Charger Hellcat SRT, but the SS is quite affordable compared to the supercharged Mopar. Priced from $45,770, the Chevy SS is cheaper than the current Charger SRT8 and fetches a lot less than the Hellcat will. Those looking for more power will have to start looking for Mercedes-Benz dealerships and the E-Class sitting at the top of its range: the E63 AMG S-Model. Powered by a bi-turbo, 5.5-liter V-8 engine, this stylish and luxurious sedan leaves rubber marks on the pavement by means of 577 horsepower and 590 pound-feet of torque. Although it lacks exactly 130 ponies when compared to the Charger Hellcat, the E63 AMG fights back with superior dynamics and luxury features. 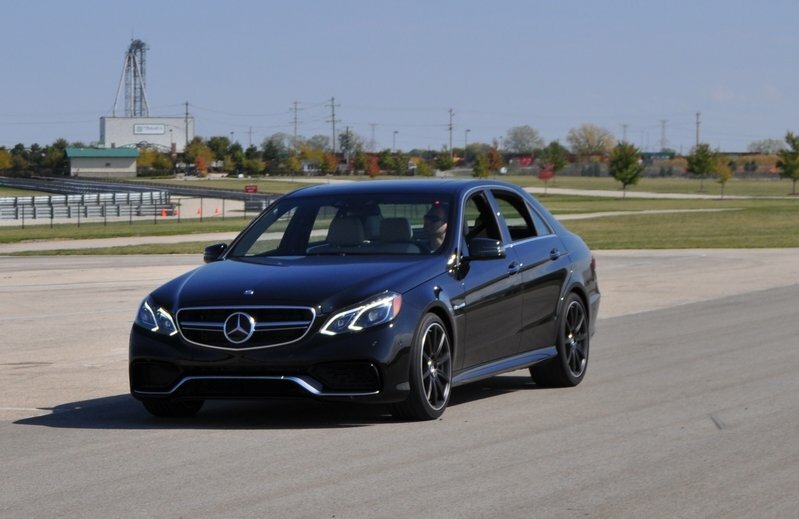 Still, the German sedan is quite the fast machine from 0 to 60 mph, achieving the sprint in only 3.6 seconds thanks to its 4MATIC, all-wheel-drive configuration. Pricing-wise, the E63 AMG S-Model costs $99,770 before options, making it about $40,000 more expensive than the Charger Hellcat SRT. The twin brother, shorter and meaner! 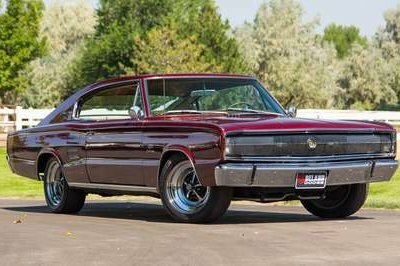 It was 1966 when Dodge introduced the 426 HEMI engine to the public, enabling the newly launched Charger to become one of the most powerful and fastest midsize vehicles of its era. It took Chrysler nearly 50 years to bring the Charger back into the spotlight with a spectacular engine under its hood, and boy what an achievement this is. 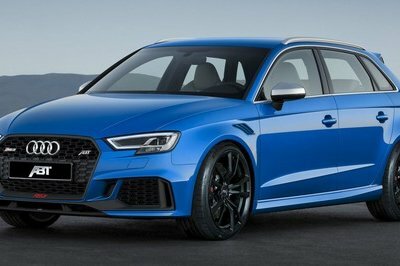 More power than any high-performance German brand has to offer, blistering-quick acceleration and quarter-mile times, and a relatively affordable price tag. There was a time when I used to hate Dodge for reviving the Charger nameplate for a four-door sedan. Well, not anymore! Updated 08/13/2014: Chrysler has just announced that a brand-new Dodge will be unveiled on August 13th at 10:30 a.m. Eastern Time. The manufacturer also released a teaser photo (after the jump) showing a sedan hidden underneath a red cover. Judging by the wheels and the way the cover wraps around the hood, the said sedan is none other than the Dodge Charger Hellcat! There is a live reveal coming up too, and we have the video feed above. Remember, it kicks off at 10:30 a.m. EST sharp! Check after the jump for live updates from the reveal in the "Reveal Notes" section. Updated 8/13/2014: We have fully updated our review of the Charger Hellcat to show you all of the patest information on the model now that it’ all official. See more after the jump. Updated 8/14/2014: If you wanted to know how the V-8 engine sounds in the new Charger Hellcat, check out after the jump. Also, Dodge unveiled a new promo video for its latest Charger Hellcat. Enjoy! Updated 10/3/2014: A report from TorqueNews claims that the Charger SRT Hellcat hit 60 mph in only 2.9 seconds with crag radials during a small gathering at Chrysler’s headquarters. 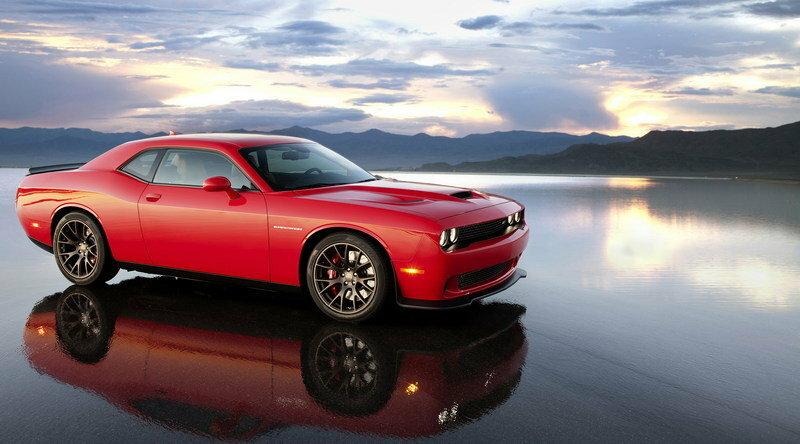 That’s a good bit faster than Chrysler’s estimated 3.7 seconds that it announced during the Hellcat’s unveiling. 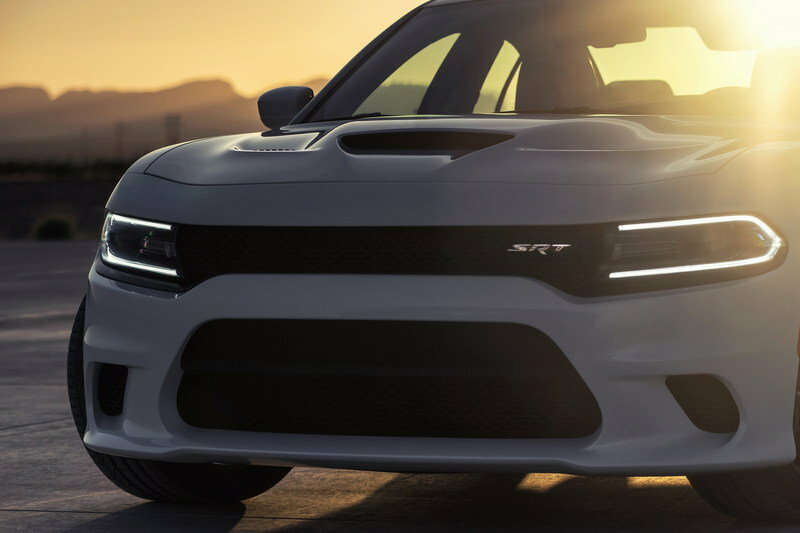 Updated 10/20/2014: Dodge announced prices for the 2015 Charger SRT Hellcat, which, according to the company "is ready to take America’s roadways by storm." The model is priced from $63,995 including $1,700 gas-guzzler tax. For the MSRP, customers will also get one day of driving at the SRT Driving Experience designed for owners to maximize their driving knowledge and skills on the street or track. 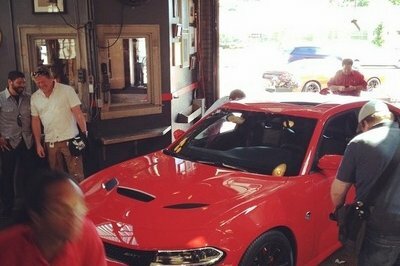 Dodge is upping its high-performance game again with the unveiling of the new 2015 Dodge Charger SRT Hellcat.